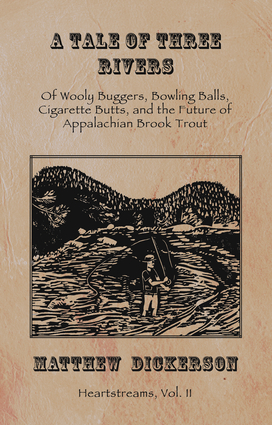 Matthew Dickerson takes his readers from an Applachian trout stream in western North Carolina where wild trout are reduced to sipping cigarette butts, up through his home state of Vermont where development and the ski industry threaten the state's iconic pastoral riversides, and finally into western Maine to a once dead river that has returned to life. The tale takes us not only to the three eponymous rivers, but to other nearby streams and waters. Though neither an historical nor as scientific text, the writing is informed by both, and as readers are drawn through the tale, they will grow in their own understanding of both stream ecology and the history of human habitation and consumption. The book is illustrated by original prints from Vermont artist Courtney Allenson. Matthew T. Dickerson is an author, a professor at Middlebury College in Vermont, a scholar of the writings of J. R. R. Tolkien and the fantastic fiction of C.S.Lewis, and an environmental journalist and outdoor writer. His books include works of fiction, biography, philosophy, and scholarship (including eco-critical work) on fantasy and mythopoeic literature. Dickerson received his A.B. from Dartmouth College (1985) and a Ph.D. in Computer Science from Cornell University (1989)—where he also did graduate work in Old English language and literature. Since 2002 Dickerson has been the director of the New England Young Writers Conference, an annual four-day conference for high school students in Bread Loaf, Vermont, that is associated with Middlebury College.